Spread the cost from only £140.88 a month with Interest Free Credit. Designed by Alain Gilles for renowned Belgian designer and manufacturer, Vincent Sheppard, the Wicked outdoor furniture collection effortlessly combines comfortable functionality with considered design details. 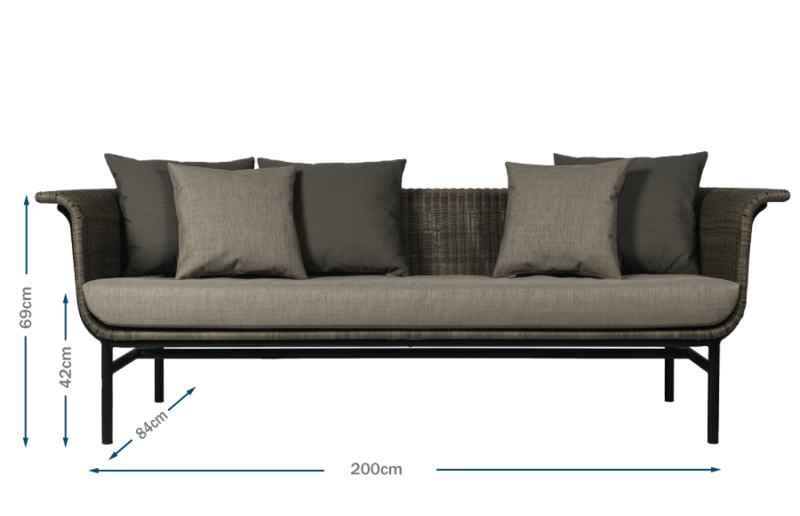 The sofa is made from all-weather handwoven polyethylene wicker with a minimalist steel frame and presents a series of elegant curves throughout its soft, flowing form. Complete with coffee and side tables featuring an aluminium frame with a solid teak top, the Wicked collection is perfect for outdoor spaces throughout the warmer months. Modern elegance and durability in one. A truly eye-catching centrepiece for any outdoor lounge area. Designed by Alain Gilles for Vincent Sheppard. The Wicked sofa is designed to be visually lightweight and has a floating effect.